Well you learn something new everyday… I do anyway, so will extend this sweeping statement to you my learned readers..
We decided – (the royal “we”) that to assist Bruce in trying to stop breaking all land speed records for distance travelled in any given week, we would stay down in Devon to see T over the weekend. This is lovely as it means we get to have some normal “quality” time – allowing things to be said and laughter to be had in “real” time rather than squashed in to the artificiality of “quality” time. I had managed to remember to book rooms with the local pub, but had forgotten exactly where that local pub was. Well it was two years since we last stayed there and I had sort of assumed that B would have remembered, even if I didn’t. How wrong could I be ! 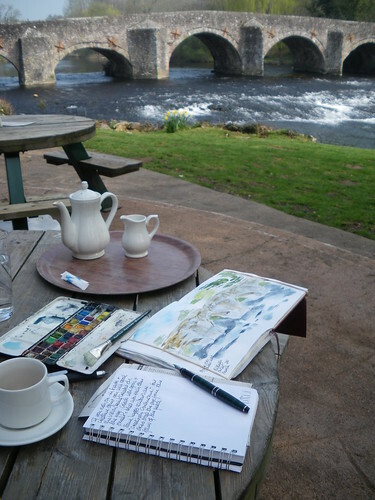 “Aah – you need the Bridge over Trouble Waters at Bickleigh” she said…. Fisherman's Cot a Private Fishing lodge built for the Bickleigh Castle Estate in 1933 was home to Paul Simon (room 6, to be precise) when he was playing his music in the area. I got so excited about the links that Google have thrown up I have just spent a couple of hours researching the history of the area, the ghost of the young lady who laughs in the bar, and public house called The Trout which is upstream. After the day I spent yesterday hearing learning and thinking about maps… well I am inspired in more than one way over all of this. !